A single radio button performs the same basic function as a CheckButton, as its position in the object hierarchy reflects. It is only when multiple radio buttons are grouped together that they become a different user interface component in their own right. Radio button widgets are created with RadioButton, passing null as the argument if this is the first radio button in a group. In subsequent calls, the group you wish to add this button to should be passed as an argument. Optionally, RadioButton.with_label can be used if you want a text label on the radio button. 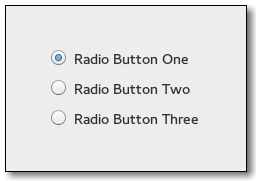 Alternatively, when adding widgets to an existing group of radio buttons, use RadioButton.from_widget with a RadioButton that already has a group assigned to it. The convenience function RadioButton.with_label_from_widget is also provided. To retrieve the group a RadioButton is assigned to, use get_group. To remove a RadioButton from one group and make it part of a new one, use set_group. The group list does not need to be freed, as each RadioButton will remove itself and its list item when it is destroyed. Button with indicator (see set_mode) has a main CSS node with name radiobutton and a subnode with name radio. Button without indicator changes the name of its main node to button and adds a .radio style class to it. The subnode is invisible in this case. When an unselected button in the group is clicked the clicked button receives the toggled signal, as does the previously selected button. Inside the toggled handler, get_active can be used to determine if the button has been selected or deselected. Creates a new RadioButton, adding it to the same group as radio_group_member. Creates a new RadioButton with a text label, adding it to the same group as radio_group_member. Creates a new RadioButton containing a label, adding it to the same group as group. Creates a new RadioButton containing a label. Emitted when the group of radio buttons that a radio button belongs to changes.